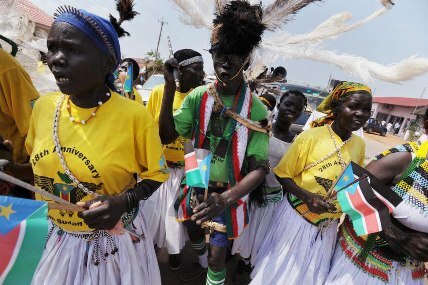 8 July 2011- On the eve of South Sudan’s independence, the Security Council today voted unanimously to set up a new United Nations mission to help Africa’s newest nation consolidate peace and lay the foundation for longer-term state-building, conflict prevention and economic development. Resolution 1996 establishes the UN Mission in the Republic of South Sudan (UNMISS) for an initial period of one year. Headed by the newly-appointed Special Representative of the Secretary-General, Hilde Johnson of Norway, the peacekeeping mission will consist of up to 7,000 military personnel and up to 900 civilian police personnel as well as a civilian component. UNMISS will take over from the UN Mission in Sudan (UNMIS), which was created following the signing of the 2005 Comprehensive Peace Agreement (CPA) that ended the north-south civil war and that paved the way for the independence of South Sudan. The Council requested Secretary-General Ban Ki-moon to transfer the appropriate functions performed by UNMIS to the new mission, including the appropriate staff and logistics necessary for achieving the new scope of functions and to begin the orderly liquidation of UNMIS. “The mandate of UNMISS shall be to consolidate peace and security, and to help establish the conditions for development in the Republic of South Sudan, with a view to strengthening the capacity of the Government of the Republic of South Sudan to govern effectively and democratically and establish good relations with its neighbours,” the Council stated in the resolution. The Council demanded that the Government of South Sudan and all other relevant parties cooperate fully in the deployment, operations, and monitoring, verification, and reporting functions of UNMISS, particularly by guaranteeing the safety, security and unrestricted freedom of movement of UN personnel, as well as of associated personnel throughout South Sudan. It also called on all parties to allow the full, safe and unhindered access of relief personnel to all those in need of humanitarian assistance, especially internally displaced persons and refugees. Mr. Ban, who arrived in Khartoum today on his way to attend the South Sudan independence celebrations in Juba tomorrow, reiterated his concern over the ongoing violence in border state of Southern Kordofan and its impact on civilians. He once against urged the Sudanese Government and the forces allied to the south to conclude a ceasefire. “I also strenuously urge the Government of Sudan and the SPLM-North [Sudan People Liberation Movement-North] to display the same leadership that brought an end to the north-south civil war, and to immediately end this new confrontation, cease all hostilities and resolve all pending disputes through negotiation. “Now is the moment for all Sudanese, north and south, to come together to shape their common future,” Mr. Ban told reporters. He said he knew that the secession of the south was painful, emotionally and financially, but he believed that Sudan will have a bright future and continue to be a leader in the region. “While the people of North and South Sudan will soon live in different countries, their future will continue to be closely linked. Ties of culture, politics and commerce compel both to face their common future as partners, not as rivals. A viable South Sudan requires a viable North Sudan, and vice versa,” the Secretary-General added. Meanwhile, the head of the UN Children’s Fund (UNICEF) today called for increased resources to help the four million children of South Sudan – 50 per cent of the total population – to survive and thrive. “Tomorrow, children who have known only war now have a chance to know peace. We must not fail them,” said Executive Director Anthony Lake. “For even in the absence of conflict, the children of South Sudan face significant challenges. One child in nine still dies before reaching the age of five. Hundreds of thousands are deprived of their right to an education, to adequate health care and other critical services. Many are still displaced and at risk,” said Mr. Lake. He emphasized UNICEF’s commitment to supporting the Government of South Sudan protect the rights of all children. In a related development, the UN Food and Agriculture Organization (FAO) said it had drawn up a $50 million Interim Assistance Plan (IAP) to help build capacity in South Sudan’s agriculture sector, prevent conflict over water resources and develop the livestock sector. “South Sudan is enormously rich in terms of natural resources, and with 95 per cent of the population dependent on them for survival, it has huge potential for sustainable growth through agriculture,” said George Okech, head of the FAO office in South Sudan. FAO currently manages a $61 million emergency rehabilitation programme in South Sudan that has already helped 250,000 returnee and internally displaced households who fled their farms during the conflict return to agriculture, as well as vulnerable households who are hosting the returnees. The agency recently carried out an extensive satellite land cover survey that showed that only 4.5 per cent of the available land was currently under cultivation.